Yale University launched Open Yale Courses in December 2007 because it believed that leading universities could make an important contribution to expanding access to educational resources through the use of technology. From the start, the courses were free and millions of you, from 228 countries around the world, have watched them on this website and through channels on iTunes U and YouTube. Sharing my own course online has been one of the most exhilarating and transformative experiences of my teaching career and the interactions I’ve had with many of you via email have had an impact on my on-campus instruction in more ways than I would have imagined possible. Other Open Yale Courses professors have had similar experiences and collectively we believe deeply in the continued promise of open education. Providing free and open access to Yale courses requires significant resources. The William and Flora Hewlett Foundation warmly supported and generously funded Open Yale Courses from its inception in 2006 with the expectation that the initiative would eventually sustain itself. We are committed to continuing Open Yale Courses but we can’t do it without you. Please help us fulfill the promise of open education by donating to Open Yale Courses in any way you can. Every gift, no matter what size, will make a difference. Thank you for your commitment to Open Yale Courses. Make a difference. 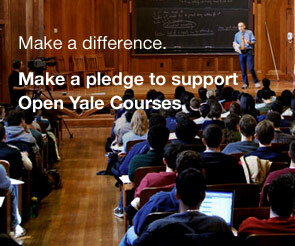 Make a pledge to support Open Yale Courses. We know that you may have some questions about supporting the Open Yale Courses project. Please visit our FAQs page to review information that may be important to you.